Boost Your Reading Productivity with a Kindle! There are very few devices that I ‘cling’ to and highly recommend them, and the Amazon Kindle has just joined this ‘privileged’ group of gadgets. I honestly cannot get my hands off it! 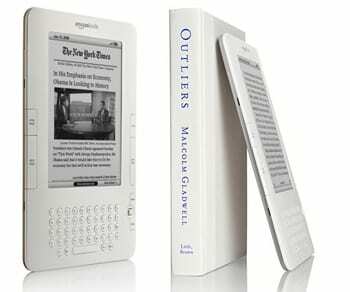 Amazon Kindle is nothing short of a revolutionary e-reading device that’s using a cool technology called “e-ink technology”, which makes the screen look like a page from a book! No, I’m serious, you got to see it to believe it. The screen is actually incredible, friends and colleagues think that there’s a sticker on top. It’s so easy to read on it and doesn’t hurt your eyes. The downside of course is that it’s not a screen, meaning when you turn off the lights, you can’t see anything! Purely and simply for reading. Nothing more and nothing less. Yes, they do have browser and you can play MP3 with it, but the prime functionality is reading. You can read books that you buy via Kindle Store, or Magazines that you subscribe wire-lessly to (I saved so much on shipping books and magazines since I got the kindle) and more. Best part is that you can also upload PDFs to it, and convert word documents and other text files into ‘kindle’ files so you can read them as well. Simply: It’s for all your reading needs. Super useful! I carry it everywhere. It’s so light and portable and you can read it under direct sunlight with no problems. You can highlight best quotes/sections and save them in a special “My Clippings” area or share them on facebook/twitter. You can search your book, bookmark pages in it, take notes, and as a plus, always know where you last stopped reading so you can pick up exactly where you left of! Can anyone buy it/use it? If you’re living in the US/UK/Canada or any other “Amazon Kindle” compatible jurisdictions then yes. If you’re outside these areas unfortunately it’s not so easy to get a Kindle working for you. Having said that, try their Kindle software and see if it works for you. Just $139! Yup, I know, it’s cheap compared with other tablets/e-readers.. and well worth every penny. Are you making commission out of this? Yup! Click here to purchase the Kindle via the ProductiveMuslim affiliate link.. But that’s not only why I’m promoting this device, honestly, my reading “productivity” quadrupled since I got the Kindle and it’s one of those MUST-HAVE devices if you love reading (and even if you don’t! ).